Roasting Toastmasters For Toastmasters Earnest Rodriguez As the old sage once said life offers thousands of opportunities to keep your mouth shut, so take advantage of them — but not at a toastmasters meeting. Toastmasters is designed to offer you the opportunity to open your mouth to inform, persuade and entertain. Toastmasters offers you an opportunity to learn by speaking, listening and evaluating. 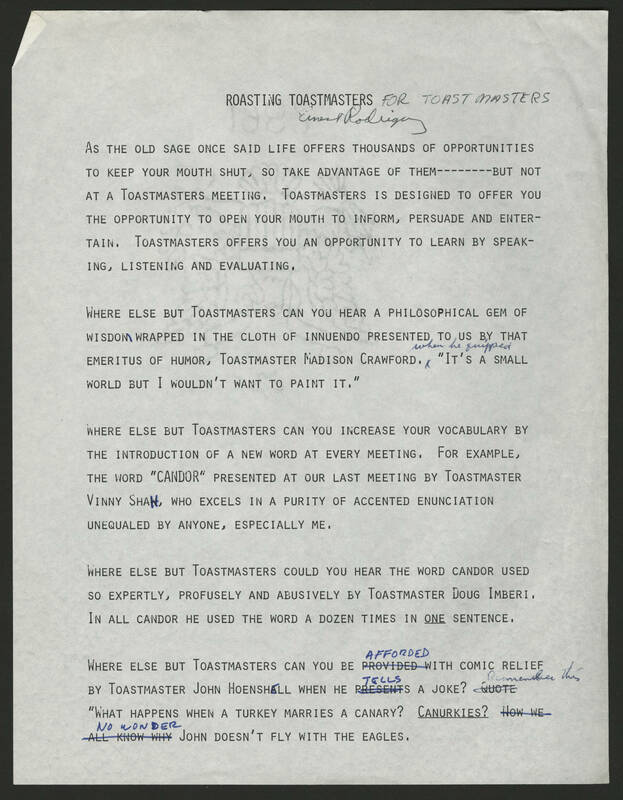 Where else but Toastmasters can you hear a philosophical gem of wisdom wrapped in the cloth of innuendo presented to us by that emeritus of humor, Toastmaster Madison Crawford, when he quipped "It's a small world but I wouldn't want to paint it." Where else but Toastmasters can you increase your vocabulary by the introduction of a new word at every meeting. For example, the word "CANDOR" presented at our last meeting by Toastmaster Vinny Shah, who excels in a purity of accented enunciation unequaled by anyone, especially me. Where else but Toastmasters could you hear the word candor used so expertly, profusely and abusively by Toastmaster Doug Imberi. In all candor he used the word a dozen times in one sentence. Where else but Toastmasters can you be afforded with comic relief by Toastmaster John Hoenshell when he tells a joke? Remember this "What happens when a turkey marries a canary? Canurkies?" No wonder John doesn't fly with the eagles.